I almost never pass up a chance to see some live music, and Madrid has a lot to offer. 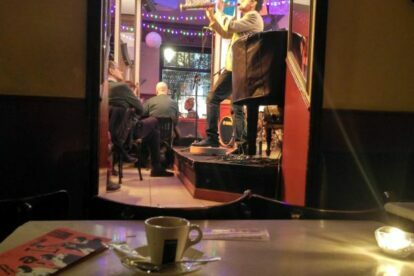 Café Central has had concerts every single day of the week for the last 36 years – it’s an emblematic venue. I’ve seen so many unforgettable performances in Central’s beautiful mirrored interior over the years, and I plan to see many more! What makes it unique for me is that you can see amazing jazz artists up close and intimate – during the 2 hour concert you can be sitting within feet of the performers. You don’t need to be a massive jazz fan to be blown away by the experience. The programme changes every week; each group usually plays from 3 to 7 nights in a row, from 21:00 – 23:00. Ticket prices depend on who’s playing, and range from 10 – 25 euros. Try an excellent fixed price lunch menu on the terraza or indooors now it’s colder. It’s a great spot for sitting outside, right by Plaza de Santa Ana and the popular Calle Huertas.